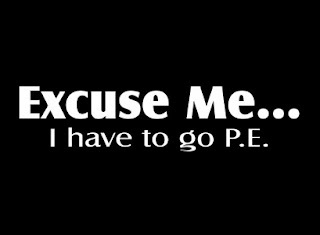 RockSports Daily Physical Education: Excuse me I've have to go P.E. Huh? What? Did I say that? What does my t-shirt say? Isn't there supposed to be a "to" in there somewhere? Oh, I get it! At RockSports there is a t-shirt for everyone. This one happens to be the shirt for the Physical Education teacher or student with a sense of humor. Hopefully your Principle also has a sense of humor. Color: You have options - Black, Red, and Kelly Green. Brand: Gildan 2000 ultra cotton 6.0 oz.